Marware has specialized in making iPod, Mac, and cell phone cases and peripherals for over 10 years. My MacBook Pro suffered from an early case of pitting and scratching on the part of the aluminum where you rest your hands when you type. As mentioned earlier, I received a replacement top case thanks to some sympathetic Apple store geniuses. I decided I didn’t want this to happen again, so I started shopping for a protector to prevent scratches, wear marks, etc. I had heard of the invisible shield from ShieldZone, but I wasn’t liking the idea of the shiny piece of plastic on the aluminum case or the expensive price tag that came along with it. As many Mac users do when they are in trouble, they go out and ask other Mac users on forums if they had any ideas. Someone on the Apple Discussions forum referred me to the Marware protection pack. I realized this kit had everything I wanted to protect my MacBook Pro from scratching and pitting. I ordered the case through Marware’s online shop (which happens to be built with WebObjects) and got it a couple days later. I have been using the protection pack from Marware for over a week, and I must say I’m very happy with the protection and comfort Marware’s product. The PVC leather handrest cover was a pain to get on perfectly, but because the cover is restickable, I didn’t have to worry about messing up. After I placed the cover on, there were no bubbles due to the cover’s thick layer. I immediately noticed the difference when I started typing with the new cover. 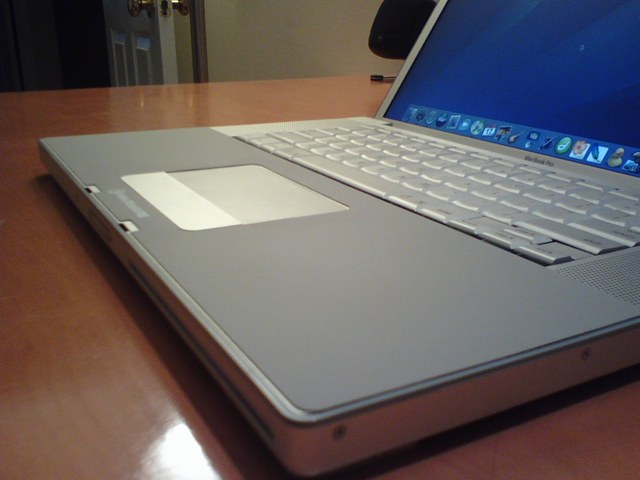 The cover makes typing much more comfortable compared to the aluminum, when your hands get sweaty and sticky to the metal. 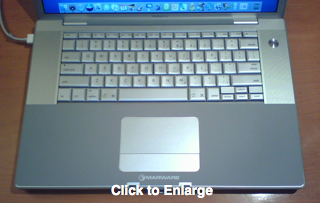 Marware has also made sure that the cover is designed to not interfere when closing the laptop. 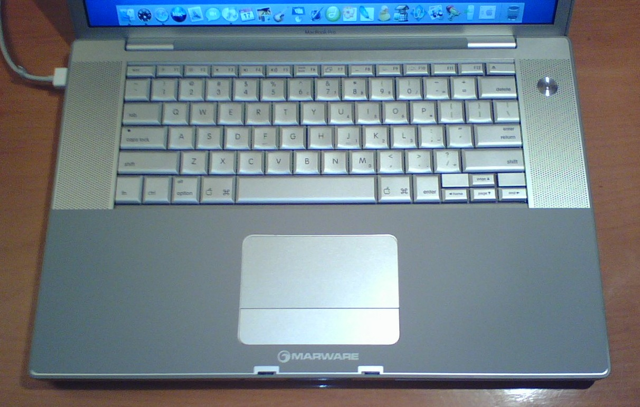 My only concern with the handrest cover is the Marware logo placed right under the trackpad. It really doesn’t bother me, but it may annoy other MacBook Pro users. Marware’s protection pack also includes a keyboard cover to protect your keyboard and to be used as a lint-free cloth to clean the MacBook Pro’s LCD screen. Although, I am somewhat disappointed in the cover. It barely covers the keyboard, it has no way to stay on the keyboard, and it obviously doesn’t protect your keyboard from liquid spills because it is made of cloth. But on the other hand, the keyboard cover is a good cloth to use to clean the LCD screen. But if you are looking for a keyboard cover, the Marware protection pack is not for you. And the best thing about Marware’s protection pack is its price. The MacBook Pro protection pack is available at $19.95 for both the 15-inch and the 17-inch models. Marware also makes protection packs for both black and white MacBooks, which could protect the MacBook’s plastic from discoloration and other wear marks. 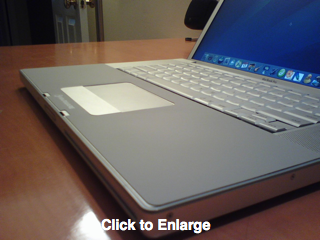 In addition, Powerbook and iBook users can also order protection packs for the same price. I’m still waiting for my protection pack for my MacBook, I ordered it last week one week ago exactly, and no word on if it shipped yet or not :(. Nevermind, I’m trying to get my cover on as we speak, it is kind of hard. Took me about 10 minutes. Really frustrating. It took about 10 to get mine to go the way I wanted it, and now I’m happy 🙂 – this thing is amazing. I like the way it feels too. I’ve been using it for about a week, but it seems my MBP runs about 10Âº hotter now. Anyone else notice this?